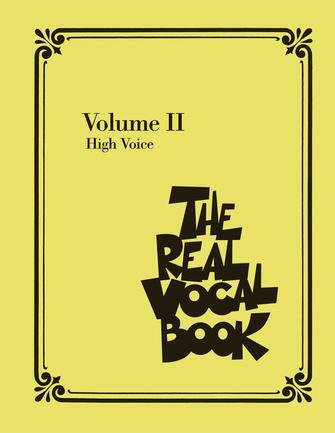 A new collection of nearly 300 songs picked especially for vocalists! Includes: Ain't Misbehavin' • All the Way • Bali Ha'i • Be Careful, It's My Heart • Bein' Green • Bésame Mucho • Blackbird • Caravan • Cheek to Cheek • Crazy • East of the Sun (And West of the Moon) • Everybody Loves Somebody • Falling in Love Again (Can't Help It) • From This Moment On • The Glory of Love • A Good Man Is Hard to Find • Hard Hearted Hannah (The Vamp of Savannah) • How Deep Is the Ocean (How High Is the Sky) • I Left My Heart in San Francisco • I'll Be Around • I'll Take Romance • I've Got My Love to Keep Me Warm • I've Got You Under My Skin • It's You or No One • Java Jive • Just Squeeze Me (But Don't Tease Me) • The Lady Is a Tramp • Learnin' the Blues • Lollipops and Roses • Lost in the Stars • L-O-V-E • Makin' Whoopee! • Mona Lisa • Moonlight in Vermont • More (Ti Guarderò Nel Cuore) • My Blue Heaven • My Heart Stood Still • A Nightingale Sang in Berkeley Square • On the Street Where You Live • Prelude to a Kiss • Pure Imagination • Speak Low • Stormy Weather (Keeps Rainin' All the Time) • Strangers in the Night • That Old Black Magic • Time After Time • Unforgettable • The Very Thought of You • What a Wonderful World • Witchcraft • You Are Beautiful • and more.